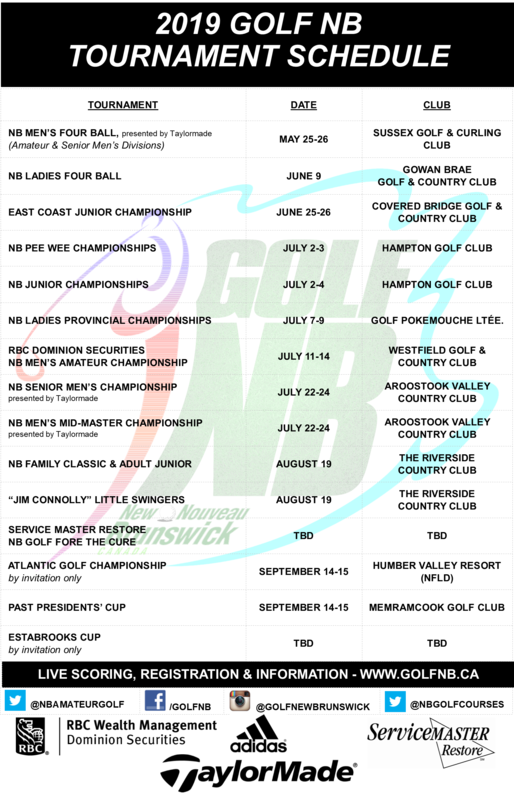 Golf New Brunswick (Golf NB) is pleased to announce its 2019 event and championship schedule which will include 14 various competitions and see the naming of some 34 separate provincial champions at 10 of New Brunswick’s top golf facilities. 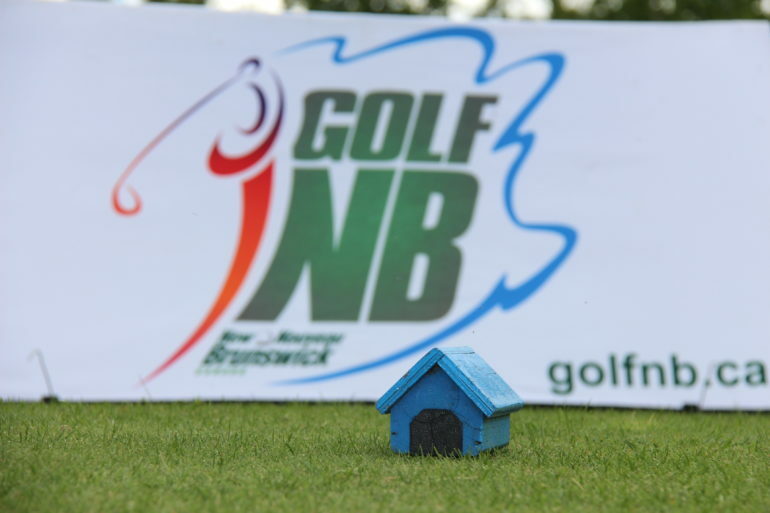 The 2019 schedule is headlined by Golf NB’s four “Major Championships”, the NB Pee Wee & Junior Championships (July 2 to 4, Hampton Golf Club), the NB Ladies Provincial Championships (July 7 to 9, Golf Pokemouche Ltée. ), the RBC Dominions Securities NB Men’s Amateur Championship (July 11 to 14, Westfield Golf & Country Club) and the NB Men’s Senior & Mid-Master Championships, presented by TaylorMade (July 22 to 24, Aroostook Valley Country Club). 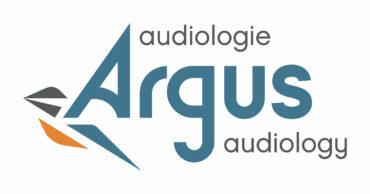 For a complete Golf NB Event & Championship Schedule CLICK HERE. 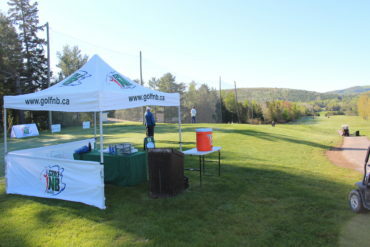 As the Provincial Golf Association and governing body of golf in New Brunswick, Golf NB conducts the province’s to amateur golf championships as part of its mandate to promote the sport and support the game of golf in the province. Golf NB is pleased to kick of the competitive golf season at the Sussex Golf & Curling Club with the 38th playing of the NB Men’s Four Ball, which will continue to host both Amateur Men’s and Senior Men’s divisions in 2019. Moved to the final weekend in May in 2018, the NB Men’s Four Ball will once again provide the perfect starting point to New Brunswick’s competitive golf season. Entry into the 2019 NB Men’s Four Ball includes two competitive rounds, a tee gift, a meal and the opportunity for prizes in both gross and net flights. The Gowan Brae Golf & Country Club will play host to NB Ladies Four Ball for the eight time in the event’s 13-year history. Tied to Gowan Brae’s annual Ladies Scramble two-person scramble, the 2019 NB Ladies Four Ball is a perfect way for the golfing women of New Brunswick to spend time with friends while enjoying one of the province’s most scenic an challenging championship courses. Entry into the 2019 NB Ladies Four Ball includes one competitive round, lunch and the opportunity for both gross and net prizing. In addition to playing host the 2019 Canadian Junior Boys Championship, the Covered Bridge Golf & Country Club will also challenge many of the country’s top young golfers during the 21st playing of the East Coast Junior Championship. With 1,000 Golf Canada Order of Merit Points up for grabs and past champions like Charles-Eric Bélanger, Valerie Tanguay, Anne-Chatherine Tanguay, Maude-Amiee LeBlanc, Ron Harvey Jr. and Brodie Flanders, the East Coast Junior Championship has been Atlantic Canada’s premier junior championship since its inception. Entry into the 2019 NB East Coast Junior Championship includes one practice round, two competitive rounds, a tee gift, lunch and championships in the Junior Boys, Bantam Boys and Junior Girls categories. For the second consecutive year, the Hampton Golf Club in Hampton, NB will play host to the season’s first major, the NB Pee Wee & Junior Championships. “We are extremely pleased to again host the provinces top junior golfers to the Hampton Golf Club”, said Craig Mills, General Manager of the Hampton Golf Club. With eight championships up for grabs, Boys & Girls Pee Wee, Bantam, Juvenile and Junior titles, as well as positions on the Team NB, there will be lots to play for on the 6,509 yard, Graham Cooke layout. Entry into the 2019 NB Pee Wee & Junior Championships includes one practice round, three competitive rounds, a tee gift and a meal for competitors. July 7 to 9, 2019 – Golf Pokemouche Ltée. Golf Pokemouche Ltée., in Landry Office, NB will challenge New Brunswick’s to female golfers, as it plays host to the 84th playing of the NB Ladies Provincial Championships from July 7th to 9th. With four trophies on the line, the NB Ladies Amateur, NB Ladies Mid-Amateur, NB Ladies Senior and NB Ladies Super Senior, as well as positions on the NB Ladies Amateur and NB Ladies Senior Teams, the 54-hole event is sure to see another exciting finish. Entry into the 2019 NB Ladies Provincial Championships includes one practice round, three competitive rounds, a tee gift and a banquet for competitors. In addition to the NB Men’s Amateur Championship, eligible players will also compete for the 2019 NB Mid-Amateur crown and five positions on Team NB, three positions on the NB Men`s Amateur Team and two positions on the NB Mid-Amateur Team. With the final Mid-Amateur Team position, as well as the first alternate positions, being awarded at the NB Mid-Master Championship to be held later in July. Entry into the 2019 RBC Dominion Securities NB Men’s Amateur Championship includes one practice round, four competitive rounds, a tee gift and the opportunity for prizing based on a minimum of four divisions. 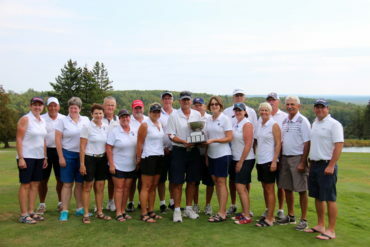 The Aroostook Valley Country Club, in Perth Andover, NB, plays host to the 43rd NB Senior Men`s Championship and the 2019 NB Mid-Master Championship from July 22nd to 24th. The two events will be run concurrently, as separate events, over the same three-day period and will carry a maximum field of 144 players over all. In addition to the NB Men’s Senior & Super-Senior Championship and the NB Mid-Master Championship, eligible players will also compete for four positions on Team NB, three positions on the NB Men`s Senior Team and one positions on the NB Mid-Amateur Team. Entry into the 2019 NB Men’s Senior & Mid-Master Championships includes one practice round, three competitive rounds, a meal, a tee gift and the opportunity for prizing based on divisions. The 40th playing of the NB Family Classic will take place at The Riverside Country Club, in Rothesay, on August 19th, 2019. This 18-hole event uses a Pinehurst Scoring method where partners both drive on each hole and then each play a 2nd shot with the other’s ball. After the 2nd shots, a choice is made regarding the ball with which the hole will be completed, playing alternate shots from there until the ball is holed out. This unique event provides opportunities for the entire family with six different division; Father/Son, Mother/Son, Father/Daughter, Mother/Daughter, Adult/Junior (Male) and Adult/Junior (Female). Entry into the 2019 NB Family Classic includes one competitive round, a meal and a tee gift. In its third year, the “Jim Connolly” Little Swingers is open to two player teams made up of one youngsters between the ages of 5 and 10 and one adult. The “Jim Connolly” Little Swingers combines a 45 minute instructional clinic with 9 holes of golf using the Pinehurst Scoring method. Named for the late Jim Connolly, the Golf Professional Emeritus of The Riverside Country Club, the “Jim Connolly” Little Swingers will be held on August 19th in conjunction with the NB Family Classic. Entry into the 2019 “Jim Connolly” Little Swingers includes a pre-event clinic, 9 holes of golf, a meal and a tee gift. The Memramcook Golf Club will play host to the 20th playing of the Past Presidents’ Cup Inter-Club Challenge. 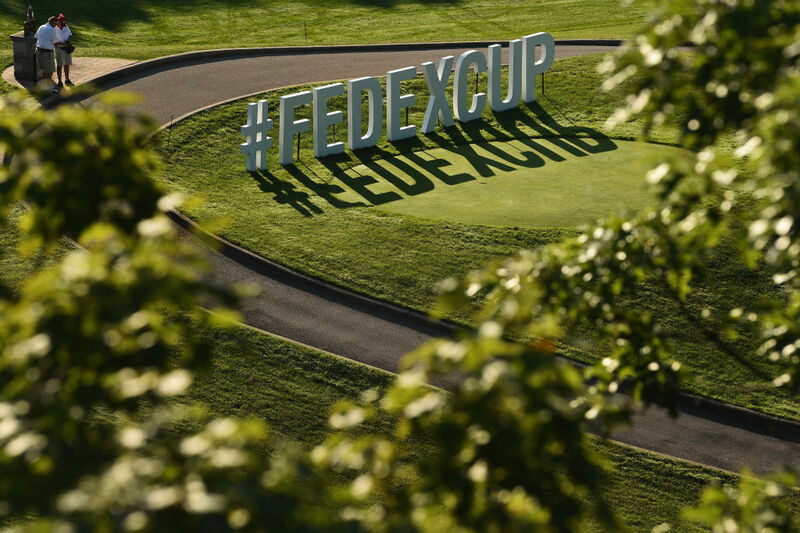 The yearlong competition saw 14 clubs enter 16-player teams (divided into five different handicap flights) in search of the 2018 crown. Each round of the competition consists of a home and home series between the clubs, with each team fielding 8 sets of two player teams who compete in a “Hole by Hole” match play format with the team winning the most total holes advancing to the next round. The final matches will be hosted at the Memramcook Golf Club on September 14th and 15th in 2019. Entry into the 2019 Past Presidents’ Cup Inter-Club Challenge is open to all Golf NB partner facilities. Still to come are confirmations on dates and venues for the 2019 ServiceMaster NB Golf Fore The Cure and 2019 Eastabrooks Cup. Updates will be posted on www.golfn.ca as they become available. Golf New Brunswick (Golf NB), a not for profit organization founded in 1934, is the official governing body for amateur golf in New Brunswick. In January of 2006, the New Brunswick Golf Association (NBGA) officially merged with the New Brunswick Ladies Golf Association (NBLGA), resulting in one united governing body for amateur golf in the province. Programs offered by Golf NB to its 8,000 members include: provincial championships, rules of golf education, course rating and handicap services, junior golf development programs and member club marketing initiatives.